Diabetes actually means that a blood glucose level is very high. As the body utilizes glucose to fulfill its energy requirements, blood always has some quantity of glucose retained in it. Too much level of glucose is injurious to health. Blood converts the entire food intake into a simplest form that is glucose and needs insulin to be absorbed into every cell of the body. Insulin is basically a hormone made in pancreas and pancreas releases this hormone in the blood stream. 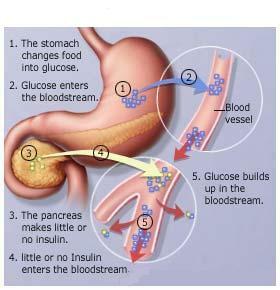 In turn, insulin helps glucose to be actively absorbed and get into the blood stream. In case if a body fails to produce insulin due to improper function or any abnormality in the function of pancreas glucose will not absorb in the body cells rather it will move with the blood in the whole body which makes a blood glucose level very high leading to diabetes. If diabetes cannot be controlled it will cause heart disease, kidney failure, stroke, blindness, amputations (removing toe or foot) and a damage to nerves. During pregnancy diabetes cause a major problem, and it will be more likely to say that a baby would be born with inherited birth defects. Pre-diabetes is one in which a blood glucose level becomes higher than it its normal value, but in fact, it is lower than a standard diabetes range, which means a serious risk of a heart disease and a type 2 diabetes. A modest weight loss and a light routine exercise can help preventing diabetes. Having informed with pre-diabetes, a person should keep checking blood glucose level for 1-2 years. Majority of Americans i.e. about 24 million are suffering from diabetes, half of them are women while one quarter of them are totally unaware that they are having diabetes. Type 1 diabetes most commonly occurs in men as well as women. Diabetes type 2 is common in older and overweight people. Following are given different signs of diabetes. A person should immediately consult a doctor having a problem from one of these. The blog was decisively fantastic! Lots of nice information and creativity, both of which we all need!